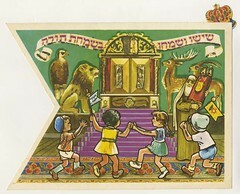 MEANS – “Rejoicing of the Torah.” Many Jews literally dance with the Torah scrolls on this day. WHAT DO WE DO? – We finish reading the end of the Torah Scroll, then quickly begin reading it again! In many congregations, this activity is accompanied by dancing, parades, and banners. WHY? – We love Torah, and we want make sure we never stop reading it. Therefore we make a very big deal about beginning again. Also, since the Torah has to be rolled back to the beginning, and that’s a big deal anyway, why not make a party of it? This is an opportunity to express our love for Torah. Details differ among Jewish communities, and your congregation may have special customs of its own. For instance, when I was a rabbinic intern at Congregation Etz Chaim in Merced, CA, we used to unroll the whole Torah scroll and take a “tour” of it before rolling it up again. Does your congregation have a special Simchat Torah custom? Share it with us in the comments! Previous Previous post: What’s Shemini Atzeret? Next Next post: What is the Kotel?